During some times of year, it could still be light out at midnight. During other times of year, the black of the night could be filled with swirling, pulsing reds and greens and yellows - a lavish natural fireworks display drawing ohhh's and ahhh's. And during one particular time of year, an obese man dressed all in red will take flight thanks to the aviation abilities of nine happy reindeer. Where will all this magic take place? The ideal destination for you may be to study abroad in Finland. How can the North Pole be a great place to study? Because your opinion, if we may write so, is entirely warped. Not vast or empty, Finland is in actuality a land of tremendous natural splendor and great adventure. It is inhabited by intellectual people with a love for learning, sports and... saunas. And if you make the right decision, it'll soon be inhabited by you, too. The most popular study fields in Finland include art and design, architecture, communications, environmental science and technology. The Finnish system of higher education is regarded as excellent and its universities are highly ranked worldwide. Students who study abroad in Finland can choose between two types of colleges: universities and polytechnic institutions. Universities are almost like graduate schools, but at the undergraduate level. That is to say that universities are more focused on the contribution to and development of research. They are also the only types of schools that offer Master's and doctoral degrees. Polytechnics, on the other hand, are more focused on the actual practice of the particular field of study, and offer real-world training for the appropriate discipline. Both offer terrific educations, so the choice is really up to you, and whatever program you plan on going abroad with. If you've chosen a study abroad program in Finland that is focused on architecture, environmental science or technology, you've lucked out - those just happen to be some of the country's specialties. The majesty of the Olavinlinna and Snow Castles. Design is a major component of architecture, and Finland is known for its excellence in design, whether architectural, fashion, textile or otherwise. If design's your thing, you won't want to pass up a visit to the galleries, studios, shops and museums of Design District Helsinki. It even has the word 'design' in the name! Environmental students, as well as anyone (and everyone) who plans to enjoy the stunning natural beauty of Finland, must embrace the country's 'Everyman's Rights.' This social standard states that while you are free to roam the countryside and waters at will, provided you cause no disturbance to man or nature. Explore the Arctic Circle, spend days in the expansive Evo forest area or study the expansive landscape on one of many hiking trails. And environmental study abroad programs in Finland expose students to this abundant natural beauty, including the country's many lakes, forests and wooded hills. Finland has more than 30 national parks, including the spectacular Koli National Park. Students can observe numerous plant and animal species, rare geological features, quartzite cliffs and pristine Lake Pielinen. Helsinki features numerous well-regarded polytechnic schools where students can study in areas including telecommunications, mobile technology and biotechnology. Keeping on the subject of Helsinki, this most known of Finnish cities offers many fine universities and polytechnics where international students can study just about any subject field of interest. Its artistic and architectural wonders, its relatively mild climate and its small-town ambiance will captivate any study abroad student, including you. When you study abroad in Finland, you won't want to be buried in books the whole time, and you shouldn't - you'd be missing out on too much. Most cities are linked by a waterway, so it can be exciting just getting from place-to-place. And if it's nightlife you're looking for, you'll find plenty in Helsinki, as well as in the bumping cities of Turku, Tampere and Oulu. No stay in Finland is complete without experiencing a sauna, of which there is (and this is no lie either) 1.6 for every Fin. You may have been in a gym sauna, but that won't properly prepare you for this. Sauna in Finland is a ritual and tradition. 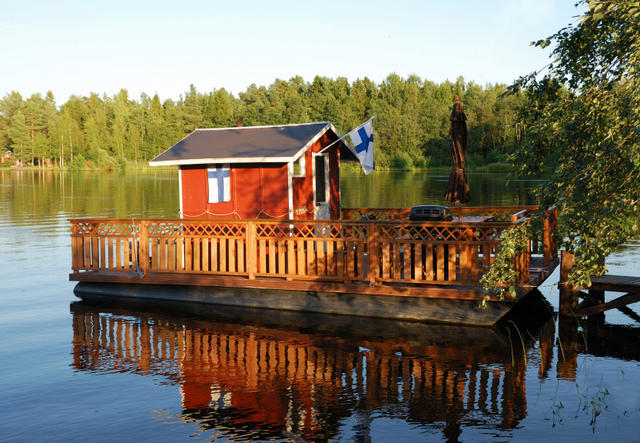 Choose from wood-burning, electric and smoke saunas, and if you really want to get into the Finnish spirit, jump from the sauna into a cold lake. Students who study abroad in Finland will encounter a collision of modern technology and age-old tradition. Fins believe very much in equality and they live by the idea of 'sisu,' a word describing the strong and brave spirit of the people. Hey, you've got to be strong to endure all that magic, like never-ending sun, laser light shows built into the night, and of course, dear old Saint Nick. Plus, a truly great education system.